OTTAWA (CIS) – The game of musical chairs continues this week in CIS men’s hockey. For the fourth time in as many national polls released this season, a new team sits in the driver’s seat. The University of Saskatchewan Huskies (7-1-0) are the new team to beat according to the 17-member media panel. The Huskies, who occupied the second spot a week ago, received 15 first-place votes and 159 points in the new poll to merit No. 1 status for the first time since the 2005-06 campaign, when they topped 10 consecutive rankings from early November to late January. The UNB Varsity Reds, Alberta Golden Bears, and UNB again had previously been ranked No. 1 this fall. The remaining first-place nods this week went to the surprising Toronto Varsity Blues (5-0-1), who make their first Top 10 appearance since 2003-04, in ninth place. The Blues were also ranked ninth on March 16, 2004. Rounding out the new Top 10 are the No. 2 Alberta Golden Bears (5-3-0), up two positions; No. 3 Moncton Aigles Bleus (4-1-1), up three; No. 4 UNB Varsity Reds (4-2-0), down three; No. 5 UQTR Patriotes (5-2-0), down a pair; No. 6 Acadia Axemen (4-2-0), up one; No. 7 StFX X-Men (4-2-0), down two; No. 8 Lakehead Thunderwolves (5-2-1), the only team to stay put this week; and No. 10 Calgary Dinos (5-3-0), down one. Saskatchewan, Alberta and Moncton all went 2-for-2 in the last seven days. The Huskies travelled to Vancouver and swept a two-game set against UBC, 5-4 and 5-1. The Bears were also on the road this past weekend and dominated Lethbridge 7-1 and 10-3. The Aigles Bleus beat Saint Mary’s 7-2 and StFX 4-2 on home ice. Meanwhile, UNB suffered its second loss of the young season on Friday night, dropping a 4-2 decision at Acadia. The V-Reds rebounded the next night with a 4-2 win at Dalhousie. Top-10 battles to keep an eye on this weekend include No. 7 StFX at No. 4 UNB on Friday, and No. 3 Moncton at No. 6 Acadia on Saturday. Top-ranked Saskatchewan enjoys a break in its Canada West schedule this week. UPDATE: David Kilfoil has his AUS Weekly Update posted over at the CIS Blog and www.hockeyscene.com has a recap up. The AUS has also finally posted the box score. The University of New Brunswick Varsity Reds defeated the Dalhousie Tigers 4-2 tonight in Halifax to gain a split on their two game weekend trek to Nova Scotia. UNB trailed 2-1 early in the 3rd period but came back with 3 straight goals from Cam Braes (his second of the game, on the power play at 14:58), Matt Fillier (15:05), and Taylor MacDougall (empty net at 19:54) to secure the victory. UPDATE: The Acadia website and hockeyscene.com both have posted recaps of the game. The AUS boxscore can be found here. The University of New Brunswick Varsity Reds gave up 3 power play goals in the first period and never recovered, falling by a score of 4-2 to the Acadia Axemen tonight in Wolfville. The game started out ominously for UNB when they took a penalty only moments after the opening faceoff, and shortly after that a turnover at the V-Reds blue line led to an Axemen goal only 46 seconds into the contest when Dustin Eckelman was all alone in front and deked the puck past Travis Fullerton. UNB would fail to convert on two back-to back-power plays of their own before the Axemen got a 5-on-3, with reigning CIS Player of the Year Andrew Clark making it a 2-0 game. Things went from bad to worse for the V-Reds in the last minute of play when the Axemen made it a three goal game with Bryce Swan sitting in the penalty box, courtesy Jonathan Laberge. The Axemen would continue to stifle UNB in the second period, only surrendering 3 shots on goal, and added to their lead when Brett Thompson followed up a Mike Cozzolla rush by knocking in the rebound. UNB came out with a better third period, generating a few more scoring chances, and finally broke Peter DiSalvo's shutout bid with 9:10 left after the rebound of Colby Pridham's sharp angle shot dropped at DiSalvo's feet, where Nick MacNeil was there to bang it home. Cam Braes would bring UNB within two goals with under 2 minutes remaining after it appeared the puck hit something above the ice surface. However, the refs conferred and ruled it a good goal. Unfortunately that was as close as UNB would get as their move to pull Fullerton in the final minutes was quickly nullified by an untimely penalty. - Chris Culligan and Marc-Antoine Desnoyers were back in the lineup. Geordie Wudrick, Stefan Salituro, and Luke Lynes were out. - UNB had 22 shots on goal. Acadia registered 20. - Acadia was 3 for 8 on the power play. The V-Reds were scoreless on their 3 opportunities, all in the opening 20 minutes. - UNB was 31 for 57 in the face-off circle. - Bryce Swan left the game in the third period after colliding with an Axemen player. He was grabbing the back of his left leg and needed help getting to the dressing room. He didn't put any pressure on his leg and he looked to be in considerable pain. - Later in the third period Ben Shutron was leveled with a massive, clean, open-ice hit as he was skating through the neutral zone. He appeared to be ok though. - UNB travels to Halifax tomorrow for a date with the Dalhousie Tigers at 7PM. - In other AUS action tonight Moncton beat Saint Mary's 7-2 at home, St. FX scored a 3-2 road victory over St. Thomas, and Dalhousie shutout UPEI at home 3-0. The University of New Brunswick Varsity Reds are back in Nova Scotia for the second consecutive weekend, beginning Friday night with a first place showdown against the Acadia Axemen in Wolfville. Game time is scheduled for 7PM. The V-Reds (3-1-0 conference record, 8-2-0 overall vs. CIS teams) reclaimed the top spot in the latest CIS rankings after a successful road trip last week in which they defeated both Saint Mary's and St. FX. The Axemen (3-1-0, 5-3-1), meanwhile, made their first appearance in the top-10 since January, coming in at 7th. KEY STATS: The V-Reds are once again among the top scoring teams in the AUS (3rd with 3.75 goals per game), as well as being the stingiest (1st with 2.25 goals allowed per game). However, one area in which they need to improve is getting the puck on net. Through 4 games UNB is averaging only 27.5 shots per game, a far cry from the 36.0 they averaged last year. This has been offset thus far by an improved shooting percentage of 13.6% (4th), compared to 11.9% and 11.1% the previous two years, and power play, operating at a league-leading 29.2% after seasons of 17.6% and 18.7%. They are also leading the conference in fewest shots allowed per game (21.0) and are 2nd in save percentage (0.903). Acadia put together another solid season last year with a 16-10-2 record, although a late slide (1-4-1 in last 6 games) cost them a chance at a first round bye and they instead had to settle for 5th place overall. They pushed UPEI in their first round playoff series as all 3 games were one goal affairs, but they eventually fell 6-5 in overtime in the deciding game to the hometown Panthers. It marked their 8th straight year in the postseason and 4th straight year with at least 14 wins. The Axemen also find themselves near the top of many categories. They lead the league in goals per game (4.75), shots per game (40.0), and penalty minutes (only 11.0 per game), and are 3rd in penalty killing (84.6%). They have struggled in areas as well, though. Their power play ranks last in the conference with a 11.1% success rate (after being 3rd at 19.3% last season) and their save percentage is also the worst in the league at 0.860, despite ranking 4th with 3.00 goals allowed per game. This is attributed to the fact that the Axemen only give up 21.25 shots per game (2nd, only 0.25 behind UNB). HEAD TO HEAD: This is the first meeting of the season between UNB and Acadia. In an odd scheduling quirk the two teams will play three games against one another in the first half, with games also scheduled for November 17th at the AUC and December 1st back in Wolfville. Perhaps even stranger, the season series will wrap up on the first day of the second half with a tilt January 4th at the AUC. The V-Reds have had an impressive run of success against the Axemen in recent years, especially considering Acadia is usually on of the better teams in the AUS. UNB has gone 18-1-1 in regular season play, 1-0 in exhibition games, and 6-1 in the playoffs over the previous 5 seasons against the Axemen, for an overall record of 25-2-1. This includes a 17 game winning streak - 13 regular season, 1 exhibition, 3 playoff - that spanned from November 2nd, 2007 until November 26th, 2010. UNB has currently won 17 consecutive games against Acadia at the AUC. LAST SEASON: The V-Reds earned 7 out of a possible 8 points against the Axemen last season. On October 28th Travis Fullerton picked up the shutout in a 3-0 UNB win. On November 12th the Axemen would rally from a 4-2 second period deficit to take a 5-4 lead in the third period, only to see Bretton Stamler tie the game 27 seconds later. The two teams would go to a shootout with Acadia eventually prevailing 6-5 after Stamler and Luke Gallant missed on their attempts, while both Axemen shooters converted against goaltender Matt Davis. The two teams would meet again on January 27th in the annual "Pink in the Rink" game and Chris Culligan (4 assists) would lead UNB to a 7-1 romp. The next game, on February 3rd, was more evenly matched but the result was the same as the V-Reds emerged with a 3-2 road win. RECENT GAMES: The Varsity Reds rebounded from a 5-2 loss against Moncton two weekends ago to record a pair of impressive road victories last weekend. They defeated Saint Mary's 4-0 on Friday night behind the impressive goaltending of Dan LaCosta (26 saves) and St. FX 4-2 on Saturday night thanks to three power play goals and a big night from Chad Denny (1 goal, 2 assists). Acadia, who also sport a 3-1-0 record on the young season, are coming off of a very successful weekend of their own. On Friday night they spoiled St. Thomas' first game at their new rink with a dominating 7-1 win over the Tommies, in which they held a 37-13 advantage in shots. The next night they faced some stiffer competition when they traveled to Moncton to face Les Aigles Bleu. The Axemen gave up a tying goal in the third period but rebounded to win 3-2 in a shootout, with rookie Brett Thompson scoring the winner. The Axemen split their first two games of the season. They dropped their home opener 5-4 to St. FX, despite holding a 43-14 lead in shots (including 19-0 in the final period), before rallying from a 4-1 second period deficit the next night to defeat Dalhousie in Halifax by the same 5-4 count. Acadia went 3-3-1 during the pre-season. They opened their exhibition schedule by hosting the Don Wells Tournament, during which they lost 6-5 in OT to Carleton and 3-2 to St. FX. This was by a pair of wins the next weekend - 5-2 over Queens and 5-0 against UQTR- before suffering a 5-2 loss to Moncton. The Axemen then traveled to the United States and split a pair of games against NCAA competition (6-2 loss to RPI, 2-0 win against Quinnipiac). WHO TO WATCH FOR ON ACADIA: The Axemen return the majority of their line-up from last season, including leading scorer and CIS player of the Year Andrew Clark (15 goals, 24 assists) and First Team All-Canadian defenceman Christopher Owens (10g, 19a). Their next 7 leading scorers are also back, led by Liam Heelis (8g, 14a), Jonathan Laberge (8g, 11a), Spencer Jezegou (8g, 9a), Michael Ward (7g, 9a), and Alex Beaton (8g, 7a). Among the 6 players who are not returning the biggest loss, points-wise, is Nicholas Chouinard (10 points). The other 5 players only accounted for 4 goals and 14 assists last year. Replacing them are a number of top recruits, with forwards Brett Thompson (32g, 38a in OHL last year) and Mike Cozzola (1.03 points per game in OHL career), swing-man Travis Randall (16 points last year in QMJHL), and defenceman Colin Archer (sat out last year, 30 points in last WHL season) being the biggest names. After a couple of years struggling to score the Axemen should have no problem finding the back of the net this season. The Axemen also return both of their goalies from last year in Evan Mosher and Peter DiSalvo. Although Mosher played the majority of games last season (1230 minutes to 476 for DiSalvo) he has struggled in the early going this year (2 games, 5 goals on 12 shots in 33 minutes), giving DiSalvo an opportunity that he has seized for the time being, posting a 1.91 GAA and .905 save percentage in 4 games. WHO TO WATCH FOR ON UNB: Much like last Saturday night it will be interesting to see who is in net for the V-Reds. While LaCosta played great in both of his starts last weekend Travis Fullerton has had great success against Acadia in the past, posting three shutouts and two playoff series wins against the Axemen in his career. It will also be interesting to see how UNB fares on the olympic-sized ice surface that Acadia features. After looking slow against Moncton two weeks ago the V-Reds were much better last week, but a group of highly skilled forwards like Acadia possesses, playing with more space than the V-Reds are used to, presents a whole new challenge for UNB. While the V-Reds have adjusted well in recent years - 10-2-1 in last 13 games in Wolfville - it should be noted that 7 out of the previous 9 games have been decided by a single goal. Cam Braes is another player to keep an eye on. After recording a goal and an assist in the season opener Braes has been held off the score sheet for the last 3 games. Expect him to get back on track, maybe as soon as this weekend, especially if Chris Culligan is back in the line-up centering the top line. FOLLOW ALONG: The game will be web-cast here. You can also follow UNBHockey on Twitter for updates. OTTAWA (CIS) – The University of New Brunswick Varsity Reds return to the No. 1 position in the third CIS men’s hockey poll of the season, thanks to a pair of road wins against top AUS opponents combined to a two-game sweep from the Saskatchewan Huskies over the Alberta Golden Bears. The V-Reds, who had opened the campaign at No. 1 before dropping to second place behind Alberta last week, received 12 first-place votes and 160 points from the 17-member media panel in the new Top 10. The other first-place nods went to Saskatchewan (4), which moves up two spots to a season-high No. 2 following its impressive sweep of Alberta, and to the UQTR Patriotes (1), who remain in third place for the third straight week. The Bears drop to No. 4 following the back-to-back losses to their Canada West archrivals. Rounding out the new media poll are No. 5 St. Francis Xavier (3-1-0), up two positions; No. 6 Moncton (2-1-1), down one; No. 7 Acadia (3-1-0), unranked a week ago; No. 8 Lakehead (4-1-1), up a pair; No. 9 Calgary (4-2-0), down one spot; and No. 10 UBC (4-1-1), ranked nationally for the first time since October of 2009. Top-ranked UNB improved to 3-1-0 in league play over the past weekend thanks to a 4-0 shutout win at Saint Mary’s and a 4-2 road victory over No. 5 StFX. The reigning AUS champions hit the road again this week for matchups against No. 7 Acadia on Friday and Dalhousie on Saturday. In Canada West, the highly-anticipated doubleheader between Alberta (3-3-0) and Saskatchewan (5-1-0) lived up to the billing with the Huskies claiming a pair of one-goal decisions on home ice, 2-1 and 4-3. The Golden Bears outshot their rivals in both contests, 30-16 on Friday and 34-20 on Saturday, but Huskie netminder Ryan Holfeld had the last laugh on both occasions. In the OUA, third-ranked UQTR (4-1-0) doubled Concordia 6-3 in its lone outing of the past week. In addition to Friday’s clash between UNB and Acadia, Top-10 battles to keep an eye on this week include Saskatchewan at UBC on Friday and Saturday, as well as StFX visiting Moncton on Saturday. Also receiving votes: Toronto (14), Western (13), Manitoba (12), Ottawa (9), Waterloo (7), Windsor (7), Carleton (4), Regina (1). - As some have no doubt heard the AUS will be putting a ridiculous roster cap in place next year. Every team will only be allowed to carry 21 skaters over the course of the season. There won't be a limit on the number of goaltenders. As one might expect, UNB head coach Gardiner MacDougall is not too pleased about it. Meanwhile, Chris Cochrane of the Chronicle Herald also gives his opinion on the matter here. - The Cape Breton Post has a small blurb about Chris Culligan being named V-Reds captain. Culligan, of course, played his entire 5 year junior career for the Screaming Eagles. - Not AUS-specific, but certainly applies to the CIS as a whole. Scott Fisher from The St. Catherine's Standard has a story about former NHL draft pick, and WHL player, J.D. Watt, who made the decision to play professional hockey and in the process forfeited all of the scholarship money he accumulated throughout his junior career. Watt argues that the one-year restriction that is placed on players in terms of deciding their future - either school or pro - should be eased. - The Chronicle Herald has a recap of Friday night's games from around the AUS, including some quotes from former Saint Mary's Husky Colby Pridham about playing against his former team. - Hockeyscene.com has short recaps posted for each of last night's games - UNB/St. FX, UPEI/SMU, Dalhousie/STU, and Acadia/Moncton. The University of New Brunswick Varsity Reds will come back to Fredericton with 4 points after collecting their second road victory of the weekend - a 4-2 win over the St. FX X-Men tonight in Antigonish. The loss was the X-Men's first of the young season and moved UNB into a tie for first place. The V-Reds got off to a good start when they converted on an early power play. Chad Denny took a quick, low shot from the point that was deflected in by Nick MacNeil to the right of goalie Joey Perricone. Ben Shutron picked up the second assist on the goal. UNB doubled their lead shortly after when Thomas Nesbitt (Denny, Carroll) was at the side of the net to backhand in a bouncing puck in the crease. The X-Men responded with a power play goal of their own when Jarrod Struthers walked off the half-boards and snapped a shot that Dan LaCosta didn't even move on thanks to a screen in front. The V-Reds answered with another man advantage goal when Ben Shutron's (Colby Pridham, Nich MacNeil) shot appeared to hit something in front before settling in the back of the net. Shots in the period favoured the X-Men 10-9. The V-Reds would run into penalty trouble in the 2nd period by taking 6 straight penalties. They managed to kill off the first three, including a full 2 minute 5-on-3, but were eventually burned on the 4th one when Michael Kirkpatrick one-timed a cross-ice pass from Brennen Wray into the net. That was the only goal of the period as the X-Men held a 7-3 advantage in shots. Both teams seemed to come out for the third period with a little less intensity and chippyness that had been prevalent through the first 40 minutes. UNB found themselves back on the power play in the opening minutes and Denny (unassisted) unleashed a shot from outside of the X-Men blue line that somehow got by Perricone, giving the V-Reds a 4-2 lead at 3:02. St. FX would pull their goalie for the extra attacker with about 2 minutes left but neither team was able to bend the twine. Shots were 10-8 for UNB in the period, but 25-22 for the X-Men in the game. - Chris Culligan was still out of the line-up for the V-Reds. Marc-Antoine Desnoyers was also out and was replaced in the line-up by Geordie Wudrick. 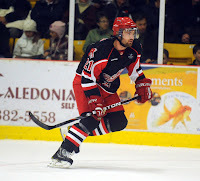 - Former X-Men Bryce Swan was targeted a number of time throughout the game, which drew three power play for UNB. X-Men defenceman Derek Claffey got caught twice, once for boarding and once for interference, while Perricone also picked up a roughing penalty after taking exception to Swan battling for the puck in his crease. The V-Reds converted on the first and last of those three man advantages. - UNB went 3 for 6 on the power play. St. FX was 2 for 9. - The V-Reds edged the X-Men 37-36 on face-offs. Cam Braes once again led the way with 15 wins on 26 draws. - Nesbitt had a game high 5 shots on goal. - Shutron, Denny, and Kirkpatrick were named the three stars of the game. - In other AUS action tonight Dalhousie defeated St. Thomas 5-2, Acadia beat Moncton 3-2 in a shootout, and Saint Mary's rebounded with a 4-0 win of their own against UPEI. - UNB is back in Nova Scotia next weekend when they face Acadia Friday night in Wolfville before making their way to Halifax for a tilt against Dalhousie the following night. The University of New Brunswick Varsity Reds look to pick up their second road win of the weekend when they visit the St. FX X-Men at the Keating Millenium Arena. Game time is 7PM. The Varsity Reds (2-1-0 conference record, 7-2-0 overall CIS record) fell out of the top spot in the latest CIS rankings released on Tuesday and are currently sitting in 2nd. The X-Men (3-0-0, 7-0-1), on the other hand, moved up from 9th to 7th. A night after former Saint Mary's star Colby Pridham made a successful return to the rink he called home for four years by scoring two goals fellow transfer student Bryce Swan will play against his former team for the first time. KEY STATS: Although they led the AUS in goals per game (4.29) and and shots per game (36.0) last season the Varsity Reds have regressed in both categories through the first three games of the season. They are averaging 3.67 goals scored per game and only 29.33 shots per game. However, their special teams have been slightly better through the first handful of games this season compared to last. The penalty killing is about even at 83.3 percent (compared to 82.9 last year) but, maybe more importantly, the power play has clicked on 4 of their first 18 opportunities, good for a 22.2 success rate after operating at only 17.6 percent last season. Although penalties have been a problem in the early going, with an average of 26.7 penalty minutes per game, the V-Reds were much more disciplined last night against SMU, accumulating only 10 minutes in penalties. They will need to stay out of the box against an X-Men team that is very dangerous on the power play. The X-Men were expected to improve on an impressive 2010-2011 campaign (17-10-1 conference record) last year, but things did not go according to plan. St. FX pushed the V-Reds to overtime in the 5th and deciding game of the 2011 AUS Championship, had a good showing at the University Cup (loss to McGill, win against Alberta), and returned many of their core players, but they were never able to get on track last season, finishing 10-14-4 to secure the 6th, and final, playoff berth. They were then disposed by Moncton 2 game to 1 in the first round of the playoffs. As their record might indicate the X-Men finished near the middle to bottom of the league in most categories, such as goals per game (6th at 3.25), goals against per game (6th at 3.71), shots per game (5th at 30.46), and penalty killing (5th at 81.3). Two things they did excel at, however, was converting on the power play (1st at 22.3) and staying out of the penalty box (2nd at 18.32 penalty minutes per game). Through three games this year they scored more goals (4.33 per game), given up fewer goals (3.0 per game), and lead the league by taking only 12.67 penalty minutes per game. They are also one of the better teams in terms of shooting percentage (2nd at 17.1 percent) and save percentage (2nd at 91.6) thus far. Their special teams could stand to improve though, placing 6th in both power play percentage (15.4) and penalty killing percentage (76.9). HEAD TO HEAD: This is the first meeting of the season between the two team. The X-Men will visit the AUC on November 2nd and January 26th. The V-Reds will return on January 11th. All games are scheduled for 7PM. Perhaps no AUS team has given UNB more trouble in recent years than the X-Men. Since the 2008-2009 season the Varsity Reds have a 12-3-1 record against St. FX in the regular season, but have won only 3 out of the 8 playoff games between the two in that span. Of course, we are sure no one forgets the X-Men putting an end to UNB's 27 game winning streak in 2009-2010 as well the shocking playoff sweep that followed weeks later. LAST SEASON: The Varsity Reds received 7 out of a possible 8 points against the X-Men last year. In the first game of the season on October 14th UNB raised their 4th National Championship banner and followed that up with a solid 3-1 victory at the AUC. A week later the two teams met in Antigonish, with the V-Reds falling behind 3-1 in the first period only to storm back and win 7-6. UNB would win their third straight over the X-Men, 5-2, on January 6 at the AUC only for St. FX to reply with a 5-4 shootout victory on home ice eight days later. RECENT GAMES: The V-Reds are coming off of their best game of the young season as they shutout the Saint Mary's Huskies 4-0 in Halifax last night. Dan LaCosta stopped 26 shots and Colby Pridham scored 2 goals against his former team as the Varsity Reds pulled away with 3 goals in the final 10 minutes of the game. This came on the heels of an up and down opening weekend on home ice. They extended their winning streak against STU with a 5-2 win on opening night only to turn around the next night and get out-skated and outplayed by Moncton, losing by an identical 5-2 score. Meanwhile, the X-Men are the only AUS team yet to suffer a loss after beating the previously unbeaten UPEI Panthers last night at home. The Panthers tied the game at 2 with only 7 seconds left in regulation but Brad Cuzner's goal 2:44 into the extra session sent the hometown crowd home happy. Last weekend seen St. FX hold on for a 5-4 victory on the road against Acadia on opening night, despite being out-shot 43-19 (including 19-0 in the final period) and then beat Saint Mary`s 5-3 the next evening in their first home game of the season. During pre-season play the X-Men posted a 5-1-1 record. They fell 2-1 in overtime against SMU in their first game only to rebound with wins over Acadia, Moncton, UPEI, and St. Thomas. They then split two games against NCAA teams - losing 5-2 to New Hampshire and then topping Northeastern 4-3.
WHO TO WATCH FOR ON ST. FX: The X-Men return their top two scorers from last season in Jason Bast (16 goals, 14 assists) and AUS Rookie of the Year Michael Kirkpatrick (15g, 15a), but lost their 3rd (Bryce Swan, 25 points), 4th (Brett Morrison (23), 5th (Kevin Undershute, 18), and 7th (Scott Brannon (14) highest point-getters. Despite these losses St. FX has tallied 13 goals in their first three games with rookies Cory McIntosh and Cole Grbavac leading the charge with three and two goals apiece, respectively. Veteran forward Brennan Wray (3 points after only 10 last year) and defenceman Derek Claffey (2 points this year, 5 last year), as well as sophomore Ted Stephens (2 points after 5 this year) have also got out to good starts this year. Spencer MacAvoy (3g, 14a last season), one of the top defencemen in the conference, is also back to anchor a defensive corps that returns all but one player from last year. They have also added another potential top pairing blue-liner over the summer with Bronson Maschmeyer joining the team after three consecutive seasons of 35+ points with Kamloops of the WHL. He has already notched a goal and assist thus far. Expect him to see plenty of time on the power play. Goaltender Joey Perricone is back between the pipes and will look for a return to his 2010-2011 form, in which he posted a 2.37 GAA and 0.925 save percentage. If he struggles like he did for most of last season (3.57, 0.874) expect to see rookie Drew Owsley, who put up solid numbers the last 4 years in the WHL, get a lot of playing time. So far Perricone has started 2 of the first 3 games, giving up only 5 goals on 64 shots in the process. WHO TO WATCH FOR ON UNB: It will no doubt be an emotional night for Bryce Swan. The St. FX graduate, who scored 107 points over the previous 4 seasons with the X-Men, will be playing against his former team for the first time. It will be interesting to see the reception he receives from the crowd, especially considering he now plays for one of St. FX's bigger rivals. The V-Reds got a great start from Dan LaCosta last night so it will be interesting to see if he is back between the pipes against the X-Men. It has been a long time since Travis Fullerton has sat on the bench for two consecutive games, but the coaching staff may want to ride the hot hand. The defence, which was exposed against a speedy Aigles Bleus squad last week, had some adventures in the first two periods last night as the Huskies hemmed them in the defensive zone for extended stretches at time as well as forcing some turnovers, but fortunately LaCosta was there when called upon to bail them out. They did put together a good final period, really clamping down and limiting SMU`s shots and scoring chances to preserve the shutout. The challenge may be tougher tonight against an arguably more talented X-Men squad. FOLLOW ALONG: The game will be web-cast on SSN. You can also check UNBHockey on Twitter for updates. The University of New Brunswick Varsity Reds got back to their winning ways with a 4-0 victory over the Saint Mary's Huskies tonight in Halifax. The Varsity Reds took a 1-0 lead at 12:48 of the first period when former SMU star Colby Pridham jumped on a loose puck to the left of goaltender Anthony Peters and made no mistake, putting it past the out-strecthed goalie. That would remain the only goal in the contest through two periods thanks to some superb play from UNB netminder Dan LaCosta, as the Huskies held a 18-11 advantage in shots on goal over the first 40 minutes of play. The V-Reds put the game away in the final period. First, a cross-ice pass from Tyler Carroll was fanned on by Bryce Swan, only to go directly to Ben Wright, who hammered it into the top corner for a power play goal at 11:07. Daine Todd also picked up an assist on the play. Pridham (Nick McNeil, Swan) would score his second of the game around the 15 minute mark to make it 3-0. Finally, McNeil (Robertson) would round out the scoring with a goal of his own on the man advantage in the dying seconds of the contest, putting an exclamation mark on a 4-0 win. UNB dominated the latter half of the game, outshooting SMU 17-8 in the period and 28-26 in the game. - Chris Culligan was out of the line-up for UNB due to the flu. Luke Lynes and Geordie Wudrick were also scratched while Ben Wright and Taylor MacDougall both made their return. - The star of the game was Dan LaCosta, making 26 saves for his first career shutout. Colby Pridham and Nick MacNeil were the 2nd and 3rd stars, respectively. - UNB converted on 2 of their 6 power plays while SMU went 0 for 5. - UNB and SMU each won 38 face-offs with Cam Braes leading the V-Reds with 12 wins in 20 tries. - Pridham had a game high 5 shots on goal and was the only player with a +2 rating. - The V-Reds are at ST. FX tomorrow night for a game against the X-Men. Game time is 7PM. - In other AUS action Acadia pounded St. Thomas 7-1 in the Tommies first game at their new rink, Moncton rallied from a 4-2 third period deficit to get by Dalhousie 6-4, and UPEI scored with 7 seconds remaining to force overtime before eventually falling to St. FX 3-2. The University of New Brunswick Varsity Reds look to get back on the winning track when they hit the road for their first away game of the season tonight against the Saint Mary`s Huskies at the Halifax Forum. Game time is 7PM. The Varsity Reds (1-1-0 conference record, 6-2-0 overall CIS record) fell out of the top spot in the latest CIS rankings released on Tuesday and are currently sitting in 2nd. The Huskies (1-1-0, 4-3-0), on the other hand, are in the unfamiliar position of being unranked. In fact, they were not even one of the 17 teams who received at least a single vote. This will also mark the first time new V-Red Colby Pridham will play against his former team. KEY STATS: Although they led the AUS in goals per game (4.29), goals allowed per game (2.54), and shots per game (36.0) last season the Varsity Reds have regressed in each category through the first two games of the season. They are averaging 3.50 goals scored per game, 3.50 goals against per game, and only 30.0 shots per game. They have also allowed 3 power play goals on their first 13 penalty kills, a success rate of only 76.9. Perhaps most frustrating has been the 19 penalties and 35 penalty minutes per game the team has accumulated thus far, only a season removed from taking the 4th fewest penalties (212) and the 3rd fewest penalty minutes (18.96 per game) in the league. The Huskies posted another typically strong season last year, finishing 2nd in the AUS for the 4th time in the last 5 seasons thanks to an 18-7-3 record. It marked the 8th straight year SMU won at least 15 games. Unfortunately, the Huskies were unable to take advantage of their first round bye and fell to Moncton in 4 games in the conference semi-finals, managing only a single goal in each of the last three games on the series. HEAD TO HEAD: This is the first meeting of the season between the rivals. The X-Men will visit the AUC on November 3rd and January 25th. The V-Reds will return on January 12th. All games are scheduled for 7PM. For the last handful of seasons there may not have been bigger rivals in the league than these two teams, due to the fact that they have annually ended up 1-2 in the standings come the end of the season and they have met twice for the AUS Championship during that span. Since 2007-2008 the V-Reds have compiled a 14-5-1 regular season record, 2-0 exhibition record, and 3-2 playoff record against the Huskies. Of course many fans remember Kyle Bailey`s overtime penalty shot goal that clinched the 2008 AUS Championship in Halifax, just as we are sure many still remember the Huskies gaining their revenge the next season at the AUC with a convincing 5-1 victory in the third, and deciding, game of the 2009 AUS Finals. LAST SEASON: The Varsity Reds won 3 out of the 4 games against the Huskies last season. In the first game of the season on October 15th UNB skated to a solid 3-1 victory at the AUC. The two teams would meet a week later in Halifax with the V-Reds once again coming out on top, this time by a 4-2 count. UNB would win their third straight over the Huskies, 3-2, on January 7th in dramatic fashion. Falling behind 2-1 only three minutes into the final period the V-Reds got a tying goal from Jonathan Harty at 10:58 and then the winning goal by Kyle Bailey on the power play goal with only 19 seconds remaining. SMU would gain some measure of revenge with a 2-1 victory on home ice only six days later thanks to a Colby Pridham 3rd period goal. RECENT GAMES: UNB is coming off an up and down opening weekend on home ice. They extended their winning streak against STU with a 5-2 win on opening night only to turn around the next night and get out-skated and outplayed by Moncton, losing by an identical 5-2 score. The Huskies are out to a very similar start to their season. They also defeated their cross-city rival - Dalhousie - 5-2 in their home opener on Friday night. They followed that up the next night with a 5-3 setback on the road at the hands of the St. FX X-Men. SMU entered the third period trailing 3-1, tied it up with 2 goals in 35 seconds in the early stages of the period, only to see the X-Men score two late to secure the victory. WHO TO WATCH FOR ON SAINT MARY'S: The Huskies did not lose a lot from last year's team in terms of number of players (just 5), but they did lose their two leading scorers in captain Colby Pridham (14 goals, 16 assists) and 5th year senior Cam Fergus (8g, 18a). However, they return their next fifteen highest point-getters from last season including Cory Tanaka (26 points), Lucas Bloodoff (19), Matt Tipoff (18), Chris McKinnon (17), and Brad Smith (15). While Pridham's team-leading 14 goals is a big loss SMU had a balanced attack last year with 20 different guys finding the back of the net. Guys like Tanaka, Bloodoff, Smith, and Stephen Johnston (9 points in 15 games last year) will be looked upon for increased production while McKinnon will be looking to get back to his 2010-2011 form (28 points in 23 games). The offense should be boosted by the official arrival of Ryan Hillier, the former Halifax Mooseheads star and 3rd round NHL draft pick, who "redshirted" with the team last season. The Huskies also return most of their defence, with Justin Wallingford (15 points) and sophomores Jamie Doornbosch (14) and Michael D'Orazio (13) most likely seeing the most ice time. D-man Kyle Pereira is SMU's lone major junior recruit this season and should move up the depth chart quickly. Anthony Peters will be the undisputed starter this year after splitting duties with the departed Neil Conway last season. Conway was solid in his 3 years at SMU, posting a GAA of 2.34, 2.21, and 2.77 during his time as a Husky. However, Peters emerged as the go-to-guy late last year, posting a conference-leading 0.915 save percentage and in all 4 playoff games.Chris Perugini is the back-up, having finished his junior career in the OJHL after spending 4 seasons in the OHL. WHO TO WATCH FOR ON UNB: It will no doubt be an emotional night for Colby Pridham. The Saint Mary's graduate, who scored 96 points over the previous 4 seasons with the Huskies, will be playing against his former team for the first time. It will be interesting to see the reception he receives from the crowd, especially considering he now plays for one of SMU's bigger rivals. Also, a number of V-Reds will be looking to get back on track after a rough outing last time out against Moncton. This includes the top line of Tyler Carroll, Cam Braes and Chris Culligan, who torched STU for 10 points on opening night only to be held scoreless with 6 shots and a -2 rating against the Aigles Bleus. The goaltending and defence will also be under the microscope after a game in which they allowed 5 goals on only 23 shots and gave up numerous odd-man rushes. FOLLOW ALONG: The game will be web-cast here. You can also follow Live Stats of the game here. UNBHockey on Twitter will be providing updates as well. OTTAWA (CIS) – The University of Alberta Golden Bears move up one position in the second national poll of the young CIS men’s hockey season to claim the No. 1 spot from the New Brunswick Varsity Reds, who drop to second place in the new Top10. Alberta and UNB both received seven first-place votes from the 17-member media panel this week but the Bears tallied a total of 155 points compared to 133 for the V-Reds. The UQTR Patriotes (1), Western Mustangs (1) and St. Francis Xavier X-Men (1) also received first-place consideration. Rounding out the new poll behind Alberta and UNB are No. 3 UQTR and the No. 4 Saskatchewan Huskies, who both hold on to their previous position; the No. 5 Moncton Aigles Bleus, up three spots; No. 6 Western, staying put; No. 7 StFX, up a pair; the No. 8 Calgary Dinos, down one; the No. 9 UPEI Panthers, unranked last week; and the Lakehead Thunderwolves, who hold on at No. 10. The big losers in this week’s voting were the reigning University Cup champion McGill Redmen, who opened at No. 5 last Tuesday despite an 0-2 start to the regular season, and now find themselves outside the Top 10 with a 1-3 conference record. McGill wasn’t the only powerhouse to struggle over the past seven days as seven Top-10 teams, including the top five, suffered their first conference loss. Alberta (3-1-0) moves up to No. 1 despite splitting a two-game set against CIS newcomer Mount Royal that included a 3-1 home win on Friday and a 2-1 road loss on Saturday. Things don’t get any easier this week for the Bears as they travel to Saskatoon for a pair of contests against the No. 4 Huskies (3-1-0), who also split a doubleheader last weekend, losing 3-1 and winning 2-1 against Manitoba. UNB (1-1-0) opened the AUS schedule last Friday with a solid 5-2 win over cross-town rival St. Thomas but the V-Reds were outplayed in their own rink the following night, falling 5-2 to Moncton (1-1-0). Third-ranked UQTR improved to 3-0 in league play last Friday thanks to a 3-2 win at Nipissing, only to lose 6-2 at Ottawa the next day. One night before its big win over UNB, Moncton had lost 4-3 to UPEI in its conference opener. In addition to the two-game series between Alberta and Saskatchewan, Top-10 battles this week include No. 9 UPEI at No. 7 StFX on Friday, and No. 2 UNB at StFX on Saturday. * Western (over StFX) was awarded the higher ranking based on number of higher-placed votes. The University of New Brunswick were defeated by the Universite de Moncton Aigle Bleus tonight by a 5-2 final, the second time in less than a month Moncton has defeated the V-Reds quite handily. There is no sugarcoating this one, folks. The Varsity Reds looked sluggish, sloppy, and slow for the majority of the game, as Moncton's speed gave UNB problems all night and led to a number of odd-man rushes. Add in the fact that goaltender Travis Fullerton didn't have his best game and the team in front of him took too many penalties and it was certainly a game that they will soon like to forget. Goal scorers for UNB were Bryce Swan, scoring his first goal in a Varsity Reds uniform to tie the game at one 9:23 into the first period, and Antoine Houde-Caron, on a great individual effort to bring the V-Reds back within a goal at 4:48 of the the middle frame. - This was Moncton's first victory against UNB at the AUC in 10 games, dating back to a 3-2 OT decision on January 16th, 2009. - It was UNB's first loss at home by more than one goal since a 5-1 loss to Saint Mary's on March 18, 2009 in game 3 of the AUS finals. Their last 8 home losses had all been by a single goal. - UNB held a 26-23 shots advantage. - The V-Reds failed to score on any of their 6 power play opportunities. Moncton was 2 for 6. - This is the 3rd time in the previous 5 years UNB has dropped one of their first two games of the regular season. The other two times were during the 2008-2009 and 2010-2011 season, both of which ended with a National Championship. - In other AUS action tonight it was St. FX getting by Saint Mary's 5-3 in their home opener, UPEI blanking St. Thomas 3-0 in Charlottetown, and Acadia rallying from a 4-1 deficit to get by Dalhousie 5-4 in overtime. - UNB's next game action is this weekend when they travel to Nova Scotia for games against Saint Mary's on Friday night and St. FX on Saturday night. The #1 CIS ranked University of New Brunswick Varsity Reds (1-0-0 conference record, 5-1-0 overall) are back on home ice tonight when they host the #8 ranked Universite de Moncton Aigles Bleus (0-1-0, 2-3-0) in a rematch of last season's AUS Championship. Game time is 7PM. KEY STATS: A season after leading the AUS in goals per game (4.29), goals allowed per game (2.54), shots per game (36.0), shots allowed per game (22.5), and face-off percentage (57.3) things went almost according to script last night for the V-Reds as they beat STU 5-2, fired 34 shots at net while only allowing 19, and won 55.7 of the face-offs. Perhaps most encouraging was the two power play goals UNB scored on only four opportunities, no doubt a welcome sight for fans who seen the V-Reds light the lamp only 25 times with the man advantage last season. After spending two seasons near the bottom of the AUS standings the Universite de Moncton Aigles Bleus returned to prominence last year, finishing third in the conference with an 18-9-1 record. They would make it all the way to the AUS Championship and, subsequently, the University Cup. The Aigles were middle of the pack in terms of a number of categories, including goal scored per game (3.61, 4th in the AUS), goals allowed (3.11, 3rd), and power play percentage (5th, 17.7). They struggled with getting shots on net (6th, 30.11), with their special teams (5th at 17.7 with the power play and 6th at 80.0 on the penalty kill), and staying out of the penalty box (217 penalties, second most in league). However, they were able to offset most of that with the second highest shooting percentage in the league (12.0) and the highest save percentage (0.907). It would stand to reason that they can't rely on that happening again and will need to improve in some of the areas mentioned above if they want to experience the same kind of success this year. HEAD TO HEAD: This is the first regular season meeting of the season between the two teams after opening their respective pre-season schedules against one another, a convincing 6-2 Moncton win back on September 17th in a game that took place in Abrams-Village, PEI. They are also to scheduled to meet on November 24th and January 19th in Moncton, and on February 8th at the AUC in the regular season finale for both squads. It will mark the 2nd consecutive season, and 13th time in 21 years, the two teams will end the season against one another. The V-Reds have gone 20-1-1 overall, and 11-0-1 at home, against Moncton since suffering a 5-3 setback on November 30th, 2007, their only loss in regulation time that season. LAST SEASON: The Varsity Reds were victorious in three out of the four regular season encounters last year, as well as all three games of the AUS Championship. UNB pulled out a 6-3 road victory behind the goaltending of Matt Davis on November 4th, scoring the final three goals of the game. Another third period rally on November 20th turned a 1-0 deficit into a 2-1 win in a rare afternoon game at the AUC. Moncton would gain a measure of revenge on January 20th with a convincing 5-1 decision at the JLL, handing the V-Reds one of their worst losses in recent memory. It also snapped what had been a 12 game winning streak by UNB over Moncton. The two teams closed out the regular season on February 11th with UNB picking up a 4-1 win in what turned out to be one of the more entertaining games of the season. The two would then meet in the AUS Championship with UNB emerging on top in three straight games to earn their 2nd consecutive banner. the V-Reds won the first two games on home ice - 8-3 and 4-2 - before wrapping up the series with a 4-0 win in Moncton. RECENT GAMES: Both teams finished their exhibition schedule last weekend. UNB lost twice (once in a shootout) and picked up a tie on their annual trip throughout the northeastern United States. They finished the pre-season with a 4-2-1 record with one tie, including a 4-1 mark against CIS competition. However, that one loss came at the hands of Moncton. UNB won their home opener last night against STU 5-2. Moncton played four exhibition games, all against AUS opponents, and went 2-2, alternating wins and losses. As mentioned previously they defeated UNB 6-2 on September 17th before losing to St. FX 5-3 on September 27th in Antigonish, NS. They rebounded with a 5-2 win over Acadia on October 3rd in Cocagne, New Brunswick only to lose 3-1 in Grand Falls, NB to UPEI. They also met the Panthers last night in their season opener, falling by a score of 4-3.
WHO TO WATCH FOR ON MONCTON: The Aigles Bleus captain, and top scorer, Dean Ouellet has graduated but they return their next 8 highest scorers off of last year's team. This includes Eric Faille (32 points), Alex Quesnel (25, but currently injured), Francis Rochon (23), Marc-Andre Cote (21), and Guillaume Parenteau (18). Perhaps their best player, however, is newly appointed captain Christian Gaudet. The former pro only played 10 games last year due to injuries but posted 14 points. Look for him to be in the running for the AUS scoring title this season. Moncton also returns most of their defence, only losing Mathieu Labrie (8 points). Over the summer they added some more skill, and much needed size, in recruits Raphael Pouliot (49 points in the QMJHL last year) and Alex Emond (48). The Aigles will need to try and find a replacement for Pierre-Alexandre Marion in goal, however. Marion finished 2nd in the AUS with a sparkling .913 save percentage last season, giving the Aigles a chance to win every night. He was perhaps the main reason Moncton got by both St. FX and Saint Mary's in the playoffs. The reigns will now be handed to rookie, and former pro, Adrien Lemay and last year's back-up Andre-Michel Guay. WHO TO WATCH FOR ON UNB: The Varsity Reds were expected to have one of the top number one lines in the AUS, if not CIS, this season and they did not disappoint in their first regular season game together. Chris Culligan, Tyler Carroll, and Cam Braes combined for 4 goals and 6 assists in UNB's 5-2 win over STU last night. Thomas Nesbitt, looking to build on an impressive rookie campaign that seen him register 21 points in 27 games, also got his season off to a good start with a goal just over a minute in. FOLLOW ALONG: If you can't make it to the AUC tonight the game will shown live on Rogers TV in New Brunswick (channel 10) as well as web-cast online. 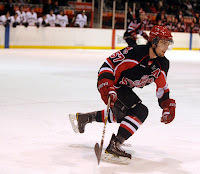 You can also follow UNBHockey or UdeM fan Philippe Poirier on Twitter for updates. The University of New Brunswick Varsity Reds got their 2012-2013 regular season off on the right foot with a 5-2 victory over the visiting St. Thomas Tommies in the 178th Battle of the Hill. The top line of Tyler Carroll, Chris Culligan, and Cam Braes paced the V-Reds with a combined 10 points. UNB got out to a quick start when Colby Pridham forced a turnover at the STU blueline and found Thomas Nesbitt all alone in front of the net. Nesbitt made a quick forehand to backhand move to beat goaltender Jon Groenheyde and give the V-Reds the advantage only 82 seconds in to the game. Carroll, with an assist to Culligan, would double the lead right off of a face-off at 7:23, scoring only 3 seconds into UNB's first power play of the season. The Tommies wouldn't go away though, surely a trait that we will see often from the Troy Ryan-coached team this year, and would be rewarded at 16:28 when Mike Reich beat Travis Fullerton to cut the deficit back to one. However, the momentum would be short lived as Carroll (Braes, Culligan) scored his second of the night just over two minutes later to restore the two goal lead going into the first intermission. Shots in the period were 9-8 for UNB. The Varsity Reds would extend their lead at 7:30 of the second when Braes (Culligan, Carroll) potted his first career CIS goal. UNB would then run into penalty trouble and Steve Stanza made them pay at 14:19 with a deflection past Fullerton on a two man advantage. That was all of the scoring in a period that seen the V-Reds out-shoot STU 13-9. UNB would clamp down defensively in the the final period, limiting STU to two shots. They would put the game away when Carroll completed his hat-trick at 15:36 with his second power play goal of the night. Culligan and Daine Todd picked up assists on the goal. Shots in the period were 12-2 in the period and 34-19 overall for UNB. - As expected Chris Culligan has been named team captain. Veteran defencemen Daine Todd and Ben Shutron will serve as alternates. - Before the game the Varsity Reds raised their 12th AUS Championship banner to the rafters. - It was also confirmed during player introductions that both Mike Thomas and former STU goaltender Charles Lavigne are redshirting this year and are expected to suit up for the team next season. - Bryce Swan, Taylor MacDougall, and Ben Wright were all out of the line-up for UNB. Swan was serving a one game suspension for his 5 minute checking from behind major he received in the game against Maine while the other two are out with an injury. As a result, UNB only dressed 17 skaters, the first time in a long time they have played without a full squad. - Attendance for the game was 3310. - UNB went an encouraging 2 for 4 on the power play. ST was 1 for 6. - Carroll (3 goals, 1 assist) was named the game's first star. Culligan (4 assists) and Nesbitt (1 goal) were second and third, respectively. - Carroll also accumulated 16 minutes in penalties, including a 10 minute misconduct. - UNB went 39 and 31 in the face-off circle. Pridham led the way with 15 wins and only 5 losses. - Braes was the only V-Red who was +2...No one registered a minus rating...Todd, Nesbitt, and Nick MacNeil all led UNB with 4 shots apiece. - Hockeyscene.com and STUTOMMIES.com have also both posted recaps. - In other AUS action last night UPEI defeated Moncton 4-3 in their home opener, St. FX posted a 5-4 road victory over Acadia, and Saint Mary's beat Dalhousie 5-2 at home. - UNB is back in action tonight at the AUC when they host the University of Moncton in a rematch of last year's AUS Championship. Led by 3 goals from Tyler Carroll with support from Thomas Nesbitt, and Cam Braes, the VReds opened the season with a convincing 5-2 win vs an improved STU Tommies team. Travis Fullerton was the goalie of record and helped the team through some penalty trouble to secure the win. When the St. Thomas Tommies skated away with a 3-1 victory over the UNB Varsity Reds at the York Arena on October 20th, 2006 it would have been almost inconceivable to believe that more than 6 years later STU would still be looking for their next victory against their cross-campus rivals. UNB has gone an unprecedented 31 – 0 – 0 against St. Thomas during this time. Here are some fun and interesting, but completely useless, facts and stats about “The Streak” as both teams prepare for the 178th Battle of the Hill - and 199th all-time meeting - tonight at the AUC. - 17 of the games have been played at the AUC, 12 at the LBR, 1 in Woodstock (2008), and 1 at the Willie O’Ree Place (2009). - It includes 23 regular season games, 3 playoff games (2008), and 5 exhibition games (2006, 2 in 2007, 2008, and 2009). - UNB has outscored STU 166-56 in the 31 games, or an average of 5.35-1.81. As the home team it is 93-29 in 18 games (5.17-1.61). As the visitor it is 73-27 in 13 games (5.62-2.08). - There have been 5 shutouts: November 24th, 2006/January 14th, 2009/January 28th, 2009/November 21st, 2010/February 8th, 2012. Travis Fullerton has accounted for the final four. - 2 games have gone to a Shootout: November 16th, 2007 and November 29th, 2008. - UNB has scored 2 goals (1 time), 3 goals (7 times), 4 goals (4 times), 5 goals (8 times), 6 goals (1 time), 7 goals (3 times), 8 goals (4 times), 9 goals (2 times), and 10 goals (1 time). - STU has scored 0 goals (5 times), 1 goal (10 times), 2 goals (6 times), 3 goals (6 times), and 4 goals (4 times). - The games have been decided by 1 goal (10 times), 2 goals (3 times), 3 goals (3 times), 4 goals (4 times), 5 goals (4 times), 6 goals (3 times), 7 goals (2 times), 8 goals (1 times), and 9 goals (1 time). - The streak has included 5 Lou Chabot Memorial Games and 5 Mark Jeffrey Memorial Games. - Only twice during the streak have the two teams played back-to-back regular season games against one another: January 23th and 25th, 2008 and November 25th and December 2nd, 2011. - This is the first game during the streak to be played on October 13th. In fact, there is only one day (January 28th) that has seen more than one game played. UNB and STU met on this day in both 2008 (9-0) and 2010 (7-1). - This will mark the first time during the streak that the teams will be playing their first regular season game against one another. However, the two teams have met in their first exhibition games twice, in 2008 and 2009. - As a result, this is the earliest in the season the two teams have played a regular season game. The previous earliest was October 16th, 2010 when the two met in their second regular season game. - Goaltender Travis Fullerton has never lost against STU during his 5 year UNB career. - New V-Red Colby Pridham is also perfect against St. Thomas in his career, posting a 16-0 record against the Tommies during his 4 years with the Saint Mary’s Huskies. - Bryce Swan went “only” 10-4-2 against STU as a member of the St. FX X-Men. - Since the streak began UNB has a combined record of 222-49-12 with 2 ties. This includes a 133-23-9 conference record, a 26-9-2 playoff record, a 12-2 record at Nationals, 38-1 in exhibition games against CIS competition, 13-11-1 with 2 ties against NCAA competition, and 0-2-1 against NHL rookie teams/AHL teams. Meanwhile, STU has gone 46-98-15 in conference play and 4-10 in the postseason during this time. 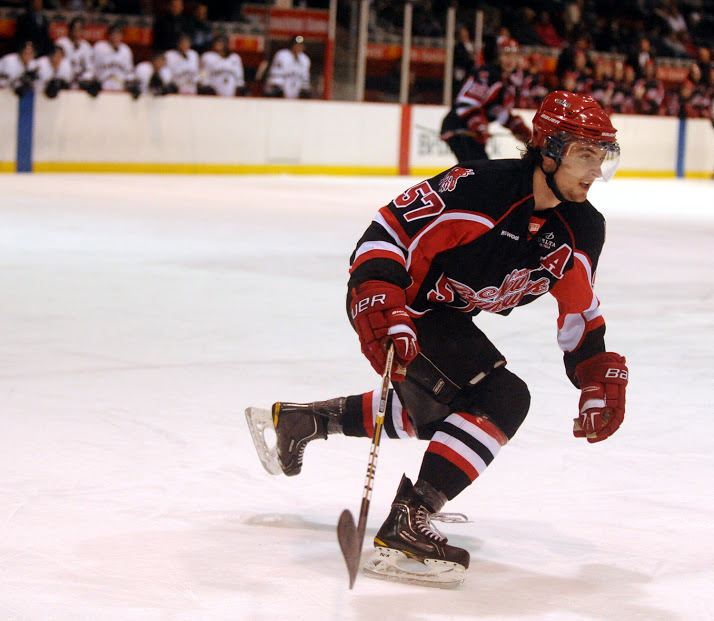 The University of New Brunswick Varsity Reds begin defense of their 2011-2012 AUS Championship tonight when they host cross-campus rival St. Thomas at the AUC to kick off the regular season. Game time is scheduled for 7PM. UNB, ranked #1 in the first top ten poll of the season that was released on Tuesday, will be looking to extend two lengthy streaks. They are currently riding a 31 game winning streak over the Tommies dating back to a 3-1 loss on October 20th, 2006. They have also won 23 straight home openers going back to a 6-5 overtime loss against Saint Mary's on November 5th, 1988. This will mark the 199th meeting all-time between the two teams, which also includes 21 exhibition games. The Varsity Reds are 136-54-8 in those games. KEY STATS: In winning 20+ games for the 5th straight season UNB led the AUS in a number of key categories last year. Some of these included goals per game (4.29), goals allowed per game (2.54), shots per game (36.0), shots allowed per game (22.5), shorthanded goals (12) and face-off percentage (57.3). They also finished in the top half of the conference in penalty killing percentage (3rd at 82.9), shooting percentage (3rd at 11.9), and save percentage (4th at 0.892). Maybe the area they will be most looking to improve on this season is the power play, ranking only 6th in the league with a 17.6 success rate. St. Thomas will be looking to improve on a 5-18-5 record last year that placed them in last place in the AUS. Despite their record they made some very noticeable and encouraging improvements in their first season under Troy Ryan, despite some terrible luck. They improved by 5 points from 2010-2011, but lost a staggering 10 games by a single goal. The Tommies gave up 28 fewer goals than the year before and improved their goal differential by an almost identical 27. They were also the least penalized team in the conference. They will most likely need to improve their special teams this year if they intend on contending for a playoff spot as they finished last in the league in both power play percentage (13.9) and penalty killing (75.0). HEAD TO HEAD: This will be the first of four regular season games played between UNB and St. Thomas this season. They will meet again on November 9th in a game that will be highly anticipated as it will mark the V-Reds first appearance at the brand new Grant-Harvey Centre. The two will also play on January 16th at the AUC and on February 1st at the GHC for the 21st Mark Jeffry Memorial Game and 19th Lou Chabot Memorial Game, respectively. LAST SEASON: The Varsity Reds swept the season series last year for the 5th straight year. In their first meeting on November 25th at the LBR the V-Reds stormed back from a 3-0 third period deficit to win 5-3 on the strength of four shorthanded goals. UNB also prevailed 3-2 in overtime a week later at the AUC with Bretton Stamler providing the heroics, 5-1 on January 18th in the 18th Lou Chabot Memorial Game, and 5-0 on February 8th in the 20th annual Mark Jeffry Memorial Game behind a shutout by Travis Fullerton. LAST WEEK: Both teams wrapped up their exhibition schedules last weekend with their annual trip to the United States. The V-Reds played three tough games, losing in a shootout to the AHL's Portland Pirates, getting defeated handily by the defending NCAA Champion Boston College Eagles 6-0, and tying Maine 2-2. UNB finished the pre-season 4-2-1 with one tie, including 4 wins in 5 games against CIS competition. STU finished 1-2 in exhibition play. They lost 4-3 to St. FX in their first game before falling to Holy Cross 2-1 and defeating Sacred Heart 4-3 last weekend. WHO TO WATCH FOR ON STU: The Tommies return their top four scorers from last season in Randy Cameron (22 points), Felix Poulin (20), Jonathan Bonneau (19), and Steven Sanza (18). New recruits Colin Martin from the OHL champion London Knights and Alexandre Leduc will also be counted on to provide offense. STU did lose goaltender Charles Lavigne, who kept them in many games and stole many points over the three seasons he wore the green and gold, but new recruit Jon Groenheyde has stepped right in and has looked sharp in his first few outings. WHO TO WATCH ON UNB: The Varsity Reds have lost 5 of their top 8 scorers from last year, but still possess an abundance of firepower up front. Chris Culligan (30 points), Tyler Carroll (26), Thomas Nesbitt (21), Nick MacNeil (16) will be complemented by new recruit Cam Braes (5 goals in 8 pre-season games) and 5th year transfer students Colby Pridham and Bryce Swan to form what should be one of the most dangerous top-9's in the country. The loss of their top three defencemen means returning blue-liners such as Marc-Antoine Desnoyers, Ben Shutron, Josh Kidd, Daine Todd, and Chad Denny will be more heavily relied upon. Travis Fullerton and Dan LaCosta both return and should provide solid play between the pipes. FOLLOW ALONG: If you can't make it to the AUC tonight there will a variety of ways to follow the game. It will be broadcast on Rogers TV in New Brunswick (channel 10), web-cast here, and broadcast by CHSR-FM either by tuning to 97.9 on your radio dial or listening online. You can also follow UNBHockey on Twitter for updates. With the AUS regular season kicking off tomorrow night I figure now is as good time as any to look at how the 2012-2013 edition of the Varsity Reds shape up, specifically compared to last year's AUS Championship squad that posted a 20-5-3 regular season record and a perfect 5-0 playoff record. It marked the V-Reds 5th straight 20+ win season and 2nd straight AUS Championship. Analysis: Fullerton and LaCosta both return for their 5th, and final, year of eligibility and will both be looking to bounce back after injury plagued seasons. Fullerton, who is perhaps the most underrated goalie in the entire nation, battled various ailments through the year but still led the AUS in GAA by a wide margin and did not lose a game in regulation until the University Cup semi-finals against Western, his 20th start of the season. Even though he has already led the V-Reds to two national championships many still argue that he is the product of the team in front of him. However, as many Saint John Sea Dogs fans will attest to, all Fullerton does is win and he will no doubt be counted on to carry the bulk of the load between the pipes once again. Maybe this will finally be the year the best goalie in UNB history gets the due he deserves. LaCosta is coming off of an up and down year in which he played more than he probably should have as injuries to Fullerton forced him to start many games even though he was less than 100%. As a result it never really seemed the former NHL'er was able to get comfortable and into a groove. Despite that he still finished 2nd in the AUS in GAA. If his stellar performance against Maine last weekend - maybe his best in a UNB uniform - is any indication a full year of good health should make LaCosta one of the best back-up goalies in the CIS. Verdict: Slight upgrade due to the reasonable assumption both goalies will remain healthier this season. Analysis: The V-Reds enter the season without their top scorer from last season but on paper one could argue that this year's offense will be better and deeper than the one that led the AUS with 4.29 goals per game last year. Obviously UNB will never be able to replace the leadership and passion that Kyle Bailey brought to the program for the last five years but just looking at the stat sheet it is reasonable to assume his production will be matched by 5th year transfer student, and former SMU captain, Colby Pridham, who should slide seamlessly into Bailey's second line centre role. Jordan Clendenning is another key loss that extends far beyond what he brings on the ice. An alternate captain last season Clendenning showed flashes of being a solid top-6 player while at UNB but, unfortunately, battled a number of knee injuries during his 4 year career. As a result he probably never quite produced at the level many fans thought he would when he was recruited after posting seasons of 58, 51, and 76 points in his last 3 years of junior. Newcomer Bryce Swan, also an alternate captain last year (with St. FX), should more than offset Clendenning's offence. Towards the end of the season it appeared UNB had found their number one line of the future with Culligan centering Carroll and Wiebe. However, with Wiebe unexpectedly leaving after only half a season there was an opening on the top unit. Enter Cam Braes. Like Wiebe, Braes is a former 40 goal scorer out of the WHL and if his impressive pre-season is a preview of things to come the V-Reds should employ one of the top lines in the AUS, if not CIS. Expect to see Braes, Culligan, and Carroll all over the score sheet this season. Another unexpected departure was the solid, if not spectacular, Dion Campbell, who decided to focus on academics this year. I expect Critchlow to be able to fill Campbell's role this season - a good bottom-6 player who can play on one of the top two lines without missing a beat if needed. Jeff Lee also decided not to return. A solid depth player who was never afraid to drive hard to the net, something I for one would like to see the V-Reds do more often, Lee seen his playing time decrease as the season went on to the point where he was a healthy scratch more often than not by the time the playoffs rolled around. Considering this he should be rather easily replaceable. It would not be unreasonable to expect veteran players such as Chris Culligan, Nick MacNeil, and Matt Fillier to have their best seasons in a V-Reds uniform as well as 2nd year players Tyler Carroll and Thomas Nesbitt to improve on their solid rookie years. Fellow sophomores Taylor MacDougall, Antoine Houde-Caron, Geordie Wudrick are all talented enough to put up decent point totals. Stefan Salituro only played 6 regular season games last year due to UNB's depth but showed plenty of promise. Count me as someone who hopes to see him in the line-up more regularly this season. Verdict: Slight upgrade due to new recruits being more than capable of filling the holes left by departing players and expected improvements of younger players. Analysis: Anytime you lose the top three scoring defencemen in the conference, who are all veterans and former all-stars, it is undoubtedly a huge loss. Veteran swing/utility man Spencer Corcoran, an underrated member of the V-Reds for the previous three season, also decided not to return. Trying to replace that kind of production and depth in one offseason would be almost impossible but UNB tried, recruiting the steady Bretton Stamler-like Adrian Robertson out of the OHL and offensively-minded Mikael Tam out of the QMJHL, but when Tam jumped at a pro opportunity it all of a sudden makes UNB's 'D' corps very questionable and a far cry from the unit that has led the AUS in fewest goals against in each of the last 5 seasons. To help make up for these losses Daine Todd will make the transition from forward to defence and the early returns are positive. No question, the biggest key for the Varsity Reds this season will be the health of their defence. The fact that Marc-Antoine Desnoyers is the only returnee who played over 17 games at 'D' is not exactly encouraging, though. Ben Wright and Josh Kidd both seem to have a hard time staying healthy for a full season (and have each already missed exhibition games this year), Todd has had a number of injuries to his shoulders in his career, Ben Shutron was well on his way to becoming one of the best blue-liners in the country in his rookie year in 2009-2010 but hasn't gotten back to that level after suffering a broken femur at the beginning of his 2nd year, and Chad Denny missed some time last year. However, if injuries do strike I fully expect to see some reinforcements added during the Christmas break in preparation for the stretch run. Now, having said that, IF (and it is a big if) everyone can remain relatively healthy this group has a chance of being one of the better units in the nation offensively. They probably won't have 3 guys put up 20+ points but they could have more balanced production from 1 to 7, with all 6 returning players having a realistic chance of far surpassing their totals from last year. Todd is obviously very offensively-gifted, as evidenced by the 28 points he posted as a forward in 2009-2010, and could be the leading scorer among the d-men thanks to his nifty stick handling and puck skills. Expect to see him jump into the play often, ala Jonathan Harty, and see plenty of time on the power play. Desnoyers and Shutron should also get lots of opportunities with the man advantage and eclipsing the 10 points they accumulated between them last year should not be too difficult. Shutron had 27 points in his rookie season but it could be argued that since his injury he has not received the playing time necessary to get back to that level, only playing 17 games last year. That shouldn't be an issue this year. Perhaps the two most intriguing defencemen are former NHL draft picks Denny and Kidd, who are a goalies worst nightmare as they both possess rocket shots from the point that I hope to see utilized plenty this season. Denny's strong pre-season play leaves me hopeful of a big season ahead, and he should help pick up most of the slack in terms of delivering thunderous hits created by the departure of Harty. Kidd has shown flashes of being a solid offensive defenceman with some good rushes from time to time and is capable of being a difference-maker in the AUS, but he will need to show more consistency. Wright and Robertson are both known as being more defensive-minded but should still be able to pick up some points here and there. Defensively speaking this unit probably won't be as good as recent years. Stamler was a rock in his own end, Gallant was more offensive-minded but still solid in the defensive zone, and Harty, while often finding himself out of position after making a big hit or joining the rush early in his career, improved by leaps and bounds at picking his spots throughout his career and turned into one of UNB's more reliable and trusted defenders. As mentioned above Wright and Robertson are both defense-first players, but we need to remember that Robertson, although solid, is a rookie and it would be unreasonable to expect him to make the transition from the CHL to the AUS without a few growing pains in the early going. The others, I would argue, are more offensive oriented and are not shy at jumping up into the rush. As a result I expect more running around in their own end as well as more shots and odd-man rushes against UNB than in recent years. Verdict: Slight downgrade, but with the potential to remain about the same with good health and guys playing to their potential. Final Verdict: Slight upgrade overall. The Varsity Reds might not have as much depth this year in terms of number of players, but I feel that the team they put on the ice every night 1 to 20 will be a touch deeper, and more talented, than last season's squad. I can't foresee them experiencing the number of injuries they had last year, especially to the goalies, so assuming even reasonable health I think the V-Reds will have a record just a bit better than last year's 20-5-3 mark. OTTAWA (CIS) – For the second consecutive year, and for the fourth time in six seasons, the University of New Brunswick Varsity Reds open the campaign atop the CIS men’s hockey national rankings. UNB received eight first-place votes and 152 points from the 17-member selection committee, with the other first-place nods going to the Alberta Golden Bears (5), the reigning University Cup champion McGill Redmen (3) and the UQTR Patriotes (1). Alberta is ranked second in the first media poll of 2012-13 thanks to a 143-point tally, followed by No. 3 UQTR (117), the No. 4 Saskatchewan Huskies (102), No. 5 McGill (74), No. 6 Western Mustangs (58), No. 7 Calgary Dinos (54), No. 8 Moncton Aigles Bleus (49), No. 9 St. Francis Xavier X-Men (46) and No. 10 Lakehead Thunderwolves (42). The V-Reds, who claimed the CIS banner three times in the past six years (2007, 2009, 2011) but were upset on home ice by Western in the final pool-play game of the 2012 University Cup championship, are once again among the early favourites to go all the way this year and have been impressive in pre-season action. UNB kept a 4-1 pre-season mark versus CIS opponents, including a 7-2 road win over national champ McGill and a 3-2 home victory against No. 3 UQTR, and also gave the AHL’s Portland Pirates all they could handle before dropping a 2-1 shootout decision, at Portland. The V-Reds kick off conference play this weekend with a pair of home games, first against cross-town rival St. Thomas on Friday night and then versus Moncton on Saturday. McGill, which captured the first University Cup title in school history last spring thanks to a thrilling 4-3 overtime win against Western in the CIS championship game, opens lower than expected in the national rankings following a disappointing 0-2 start in league play. After winning three of four pre-season contests, the Redmen were upset 6-5 by Concordia last Friday in their conference opener, before losing 5-2 at home to UQTR on Saturday. McGill lost many key players following last spring’s triumph, including two-time CIS defenceman of the year Marc-André Dorion, former CIS MVP and scoring champion Alexandre Picard-Hooper, reigning University Cup MVP Francis Verreault-Paul, as well as team captain Evan Vossen, who scored their historic OT goal against Western. No. 2 Alberta started the regular season back on Sept. 28-29 with a two-game sweep of Manitoba on home ice, 4-2 and 7-2, before enjoying a break in the Canada West schedule on Thanksgiving weekend. In addition to its impressive 5-2 road win against McGill on Saturday, third-ranked UQTR defeated Nipissing 7-4 at home in its OUA opener, last Friday. No. 4 Saskatchewan, which will host the 2013 University Cup championship in Saskatoon from March 14-17, opened Canada West play with two road wins against CIS newcomer Mount Royal, 5-4 and 5-3. NOTE: UNB was ranked No. 1 in 15 of 18 national polls last season, and has topped 58 of the last 83 polls (69.9%) since 2006-07. Other teams receiving votes: Saint Mary’s (21), Manitoba (14), Windsor (14), Acadia (13), Concordia (8), Nipissing (6), UPEI (5), York (4), Brock (3), Regina (3), UBC (2), Ottawa (2), Wilfrid Laurier (2), Carleton (1).